The resurgence of art galleries in downtown Los Angeles have helped elevate the city center as a destination for culture, entertainment, and innovation. While many museums in Los Angeles span the globe for collections from renowned artists, L.A.undry pop up art exhibitions gather local and emerging artists in unorthodox settings. 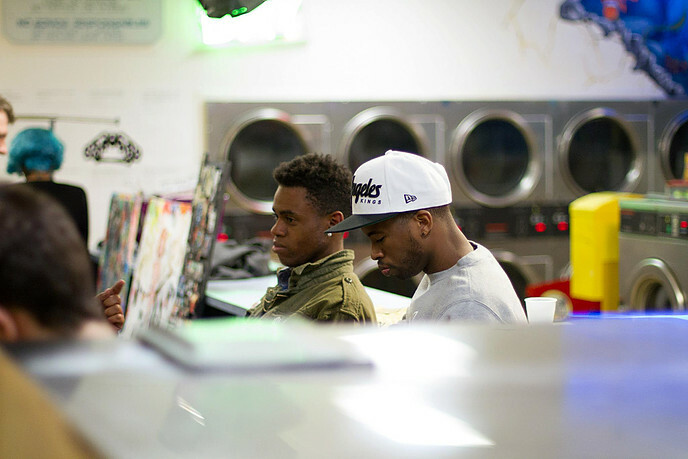 Laundromats are in some ways the informal community hubs that dot under-served areas. Not only do they fulfill a practical need for its patrons, but also indirectly create an environment that encourages conversation, interaction and exchange to occur organically across backgrounds, language and culture. L.A.undry compliments this environment with a subtle disruption brought about through the universal language of visual art. L.A.undry challenges the notion that art needs to be presented in art galleries in certain areas. In general there is a deficiency of “social” investment in the arts. This is especially profound in historically low-income areas that have little to no infrastructure for creative projects to be nurtured or encouraged. Much like graffiti and other displays of “street art”, L.A.undry is a response to an environment that hasn’t formally set up outlets for creative expression. Founder & Curator: Hassan Nicholas del Campo is a Los Angeles-based artist and social entrepreneur. He has curated for Imaginese and is currently a volunteer curator for Lexicon of Sustainability. Hassan was also co-founder & owner of Manifesto Cafe, a social enterprise cafe and t-shirt line Wake.Up.Tokyo. He is currently Marketing Director of Social Mediums, a boutique digital marketing agency. SUBSCRIBE to mailing list here.